Teardrop Banners: Best Advertising Solution for Coffee Shops and Food Vans? 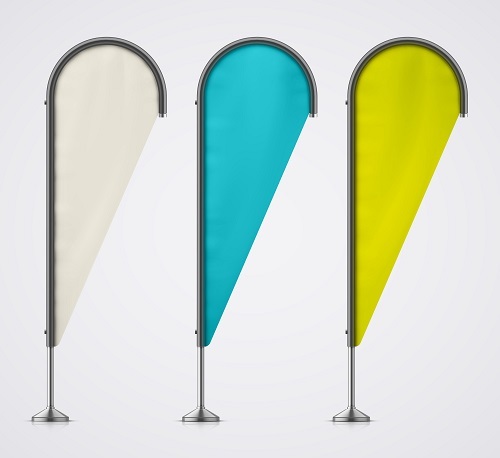 Teardrop banners are small flags shaped like teardrops. They may be small, but they get big results. We carry a variety of large and small advertising flags, teardrop banners and vinyl banners. They have been proven to be one of the most cost-effective forms of advertising for large and small businesses in the Perth area. So, why are so many coffee shops, cafes and mobile food businesses using teardrop banners to increase their business? The short answer: because they work. In a mobile food and beverage truck, every cubic centimetre of space is at a premium. Everything is contained in a small space. Once the business is on location, there is no “safety net.” Everything they need has to be there or it can ruin their day. In addition, there are many locations where there just isn’t any room for a large sign or banner. Luckily, teardrop banners are a perfect solution. When setting up the food and beverage truck, all the owner has to do is place the teardrop flags in a place where they draw attention. They can be used to attract attention, but they can also be used to advertise menu items for those who are in line. Either way, teardrop banners are great because people walking by hear them flapping in the wind. It is impossible to hear that noise and not look over to see what is making it. While the truck itself attracts attention, the teardrop flags can make a difference between an ordinary sales day and a great one. Teardrop banners are perfect for sidewalks outside of small cafes and coffee shops. Most conventional signage is higher than the potential customer’s eye level, but teardrop banners are in their field of vision. When the customer hears the teardrop banner moving in the wind, their eyes are attracted towards the banner. Sometimes that is the difference between someone walking by and stopping by. Call (08) 92444 111 to learn more.